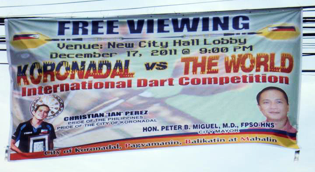 The World Darts Championship was beamed live through TV streaming in Koronadal City Hall and South Cotabato Provincial Capitol Compound, hometown of Ian Perez, compliments of the city and provincial government of South Cotabato led by City Mayor Peter B. Miguel and Provincial Governor Arthur Y. Pingoy Jr. Ian is a local sports hero. Darters nationwide were hooked to the live TV streaming. As a nation we were proud as Ian carried the Philippine flag on his uniform. As darters ,we know Ian can compete among the best in the world. It is very ironic and tragic that beneath this façade lies the spectacle of greed, arrogance, deceit and duplicity - where the basic tenets of righteous conduct, ethical behavior and moral conviction were forsaken. Ian is a victim of this spectacle. He left for London, alone and in turmoil, after a month of uncertainty and struggle. Emotionally drained he gloriously fought the battles to give us honor and self-respect. Ian’s travails, his pain and anguish need to be known. Few days after winning the Philippine Qualifier a playing contract agreement was emailed to Ian for conformance and signature. Simultaneously, the same contract was emailed to Ian’s manager, Tito Soncuya, for approval. Provision 8: He understands that the sharing of cash prize between Promoter and Player will be on a 50-50 basis after entering the 2nd round or next 64 Player Round less applicable taxes and other expenses advanced by the Promoter……………. Provision 9: He fully agrees further that the guaranteed cash prize shall be made payable to the account of the Promoter (Mr. Jose S. Claudio, Jr.), the latter having advanced all expenses pertaining to LWDC. • Tito requested for an amendment of provisions 8 and 9 before the playing contract will be signed by Ian. • Claudio insisted that no revisions can be made considering that the same contract was signed by Boy Gionzon last year and should similarly be signed this year. • Tito stood his ground that Ian will not sign the contract in its present form. • Claudio insisted that that such contract was sent to and approved by the PDC and he will be forced to inform PDC that Ian is waiving the player contract agreement. Thus the waiting game began. Jojo Claudio consulted with the DCP that Ian, with his manager, was not willing to sign the player contract. November 15, 2011, Ian enplaned to Manila from Koronadal for the processing of his London Visa, which was filed, approved and issued on November 19, 2011. Nov 20, 2011: Back in Koronadal Ian was already highly agitated and was having a hard time focusing on his preparation for WDC in London. He have been hearing rumors ,fed by his brother Bruce who was based in Manila, that the DCP may be looking for an alternative to replace him or because he refused to sign the contract to hold him from going to London. Confused and demoralized Ian sought the advice of his manager. Tito’s advice was to send an email to Matthew Porter, the Chief Executive of PDC, to directly find out what his status is - for ultimately, the final decision rests with the World Darts Championship organizers. This is Christian D. Perez Philippine representative to the world darts championship. Thank you for the invitation to participate in the 2011/2012 Ladbrokes World Championship. I am confirming my attendance and looking forward to play again in the World Darts Championship. I have personally submitted and paid all visa application requirements and my visa will be released in a few days. At this time I am totally confused and lost on the demand being made for me to sign a player-promoter contract which is contrary to the previous arrangement when I first played in the WDC last December 2009. The player-promoter contract was presented days after the Philippine Qualifier event and was not discussed or we were not informed prior or during the PQ schedule. I need your advice and guidance on what I should do so I can fully concentrate on my training. Should I not sign the contract on the grounds that it is not fair, will I lose my chance to play again in the World Darts Championship? Must I sign the promoter-player contract in order to play? This is becoming too emotionally draining and please guide me accordingly as soon as possible. Thank You and I would greatly appreciate for your feedback. Thank you for your email. Please rest assured that your place in the event is safe and there is no requirement from the PDC for you to sign any paperwork with the promoter. I will review the paperwork you have sent me and discuss with the promoter but please don't worry about it personally. Your prize money will be paid to you directly and you will be in the draw for the event on November 29. Please can you send me confirmation of your visa, travel and accommodation details whilst in London. Thanks for contacting me, congratulations on your qualification and good luck with your training! All communications from the promoter stopped despite the inquiry of Ian for any paper works that needs to be done. The issue has been resolved by the PDC. There is no need to sign any paper work with the promoter. Ian registered for the 1M tournament. Andy Arrieta, President of DCP, talked with Ian and his father, Mr. Bebot Perez. Ian was asked to sign the contract again in its original form. Ian refused to sign based on provisions 8 and 9 and Porter’s email stating that there is no need to sign a contract. Arrieta countered that the 50-50 sharing will be scrapped just sign the contract. Ian refused for there was no need to sign any contract according to Porter. Ian was further threatened that his visa can be revoked. With the meeting going nowhere Arrieta banned Ian from playing in the tournament for his refusal to sign the contract. His registration fee was refunded. This is an open defiance of the mandate of the Professional Darts Corporation that no paperwork is needed for Ian to sign as the PQ representative. It is clear that PDC will discuss this with the promoter as stated in the email of Porter. Then why should this happen? Through the intervention of Manny Pacquiao’s tournament representative Ian was allowed to play. But Ian’s future remains the same banned from DCP events. Arrieta stated that there is already a board resolution to this effect. Ian played under these trying circumstances, humiliated, persecuted, pained and disturbed. December 13, 2011: Ian Perez left for London alone, deserted and neglected by the promoter-organizer of the Philippine Qualifier. Ian Perez, a brave man stood his ground.